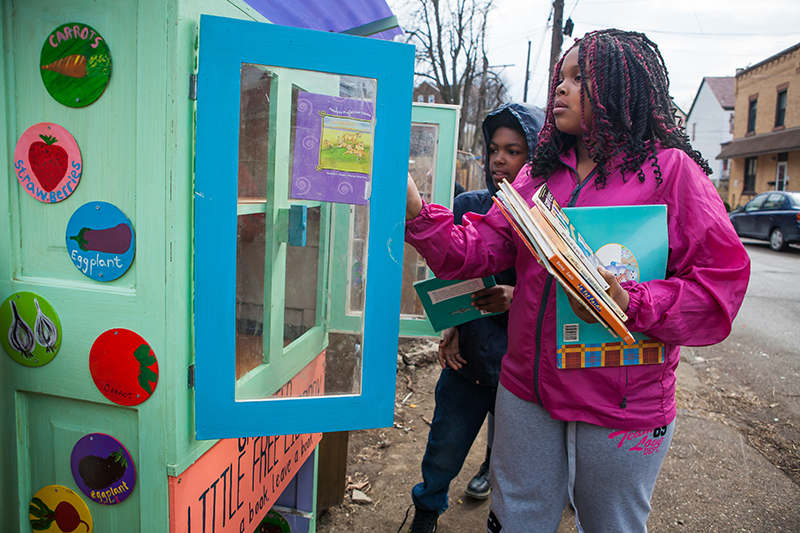 One afternoon in April 2013, located between North Graham and North Aiken Street in the Garfield neighborhood of Pittsburgh, Pennsylvania, Leah Thill anxiously awaited the arrival of neighborhood volunteers. Thill, then 23, was a first year AmeriCorps participant with the Pittsburgh Urban Leadership Service Experience (PULSE) and garden coordinator at the Kincaid Street Community Garden. The plan was to fill ten more new garden beds with soil, which involved transferring several hundred pounds of dirt from piles to wooden framed sections. Not an easy task! But, no adults showed up that day. It is this kind of excitement that inspired the creation of the Children’s Discovery Garden, a special section of the Kincaid Street Community Garden designated especially for the neighborhood’s children. 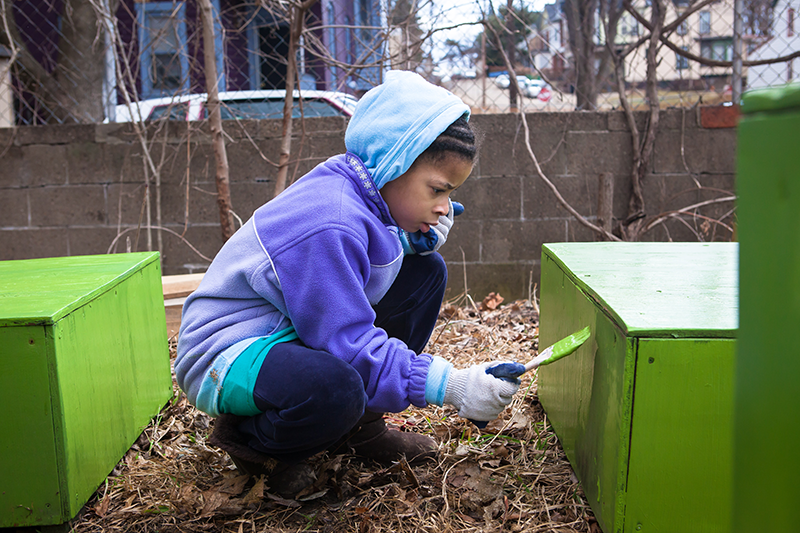 The community garden had its first season during 2013, and while it began to bring the members of Garfield together in new ways, it became clear very quickly that there wasn’t enough planning or programming to engage the youth who wanted to be involved. The creation of the Children’s Discovery Garden is a community driven effort, made possible by the collaboration of about twenty families, PULSE participants, like Thill, who live communally in a house adjacent to the garden and neighborhood volunteers with the Garfield Community Action Team (GCAT) who are involved in fundraising for the garden and coordinating volunteer events to the make the expansion happen. Between the construction of a Little Free Library by GCAT and a local youth art gallery, Assemble, signage differentiating the herbs, tomatoes, and berry bushes, and special gardening time on Wednesdays from 6pm until dusk, the Kincaid Community Garden members have been working hard to create a special place for the children. And, according to Fairclaugh, the children are learning a lot more from the garden than just patience. They’re growing vegetables they’ve never seen and seeing the benefits of earthworms. Even beyond the children, Kincaid Community Garden has been a uniting force in the neighborhood. With parts of Garfield and many of the surrounding areas experiencing rapid gentrification and rising rent prices, a gathering space that strengthens communities through shared experiences and the creation of relationships built on trust and friendship has become ever more valuable. And there is no better place to start that sharing than with the neighborhood children. With your support, the Garfield community can continue to become stronger through the communal experience of growing food together in a place that nurtures curiosity and fosters exploration in young and old alike. Thank you to everyone who contributed financially or donated their time and energy to make the Children’s Discovery Garden expansion come to life.